Journal Journey and Joy! : I came back to Heidelberg for one week! I came back to Heidelberg for one week! Finally, I came back to Heidelberg last night! I left loving Heideberg 3 years ago. I learn German at the Language school in University for one year. 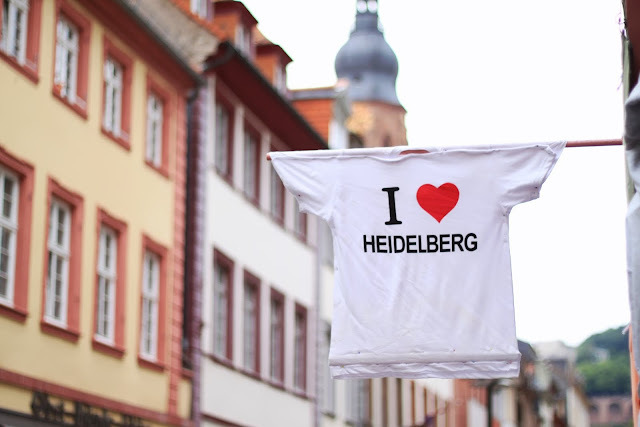 For me, Heidelberg is one of my hometowns. I have bright memories for every single street there. I miss them for a long time since I left. When I was in HD, after I got up I told "good morning" for my Basil and water them. I ride a bicycle every day to go to the school and every Sunday, we have played soccer in the professional court, but I ate lots of Beer, meats, and cheeses at that time, I became chubby. I often ate sandwiches, one of my friends called me "Mr. Sandwich". We celebrate the new year with my friends nearby the Heidelberg castle. With my girlfriend, I went to Christmas market on Uni platz. In the summer, we did BBQ by Necker river. When typhoon came to HD, with my crazy friend, we changed clothing to swimwear quickly then we danced or played jumping rope. I can't stop writing about Heidelberg memories. I don't think Heidelberg is the best city to go to sightseeing. There are a beautiful mountain, castle, river, and Church. Everything is great to visit but not special for me. Anyway, I left Germany, because I will learn English. English is now more widespread and international language as you know. I gave up to learn German then started English. Then I went to U.S, Ireland, England but after three years, I realize how wonderful Germany and how I love Germany. I will come back Germany again. I have written "why" before. let me know! Grab Beer together like three years ago! I forgot many German words but still I love to talk in German. Ich habe lust Deutch zu sprecchen!!! [Movie]Amazin Hotdog master in Bulgaria. My first time to make Jack-o-Lantern. I love it at first sight Lebkuchen Box! Pizza "Napoli" is the best Pizza in Galway. A young lady suicide from overwork in Japan. "Nuclear Withdrawal" referendum in Switzerland.